Brian Ebersole will return to the Octagon when he faces Rick Story in a Welterweight clash at UFC 167 on Nov. 16 in Las Vegas. Ebersole hasn’t been seen since dropping a split decision to James Head in Calgary in July of 2012. Despite chatter that he would drop to lightweight, due to the inactivity after an injury-plagued 12 months, he will return at 170 pounds. “Couldn’t get to LW (Lightweight) during such long period of inactivity. We’ll see if I can keep healthy post-fight, and try 4 next year,” Ebersole said via his Twitter account. 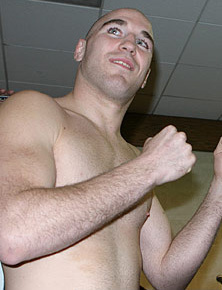 His loss at UFC 149 snapped an 11-fight winning streak for the Thailand based fighter. Story, 29, comes into the clash having lost four of his last six bouts, with a recent split decision loss to Mike Pyle at UFC 160. The UFC 167 card will be headlined by the welterweight title fight between Georges St-Pierre and Johny Hendricks, with Chael Sonnen taking on Rashad Evans in the co-main event.